We are regularly asked how best to transfer embroidery images to fabric. Professional embroiderers use a system call “Prick and Pounce”. It enables a relatively quick way to get an image onto fabric without making it permanent. You can trace directly onto fine fabrics, especially if a light box is used to make the design easy to follow but what happens when the fabric is dense or has a textured surface? Pre drawn iron on designs are also available but the marks are permanent, so the stitches need to cover the lines which may limit your stitch choice. They can often move slightly under the iron which makes transfer tricky. The prick and pounce technique offers the most flexibility and because the pounce brushes off, if you do make a mistake, you can simply remove it and try again. How does prick and pounce work? A design can be drawn or printed on a normal sheet of printer paper. Fine holes are then pricked along the design lines at regular intervals. The pricked design is then placed on the fabric where the image is required and held in place with pins or low tack tape. The pounce powder is applied with a soft pounce pad in circles over the design, so that the fine powder goes though the holes onto the fabric. Ta Dah! 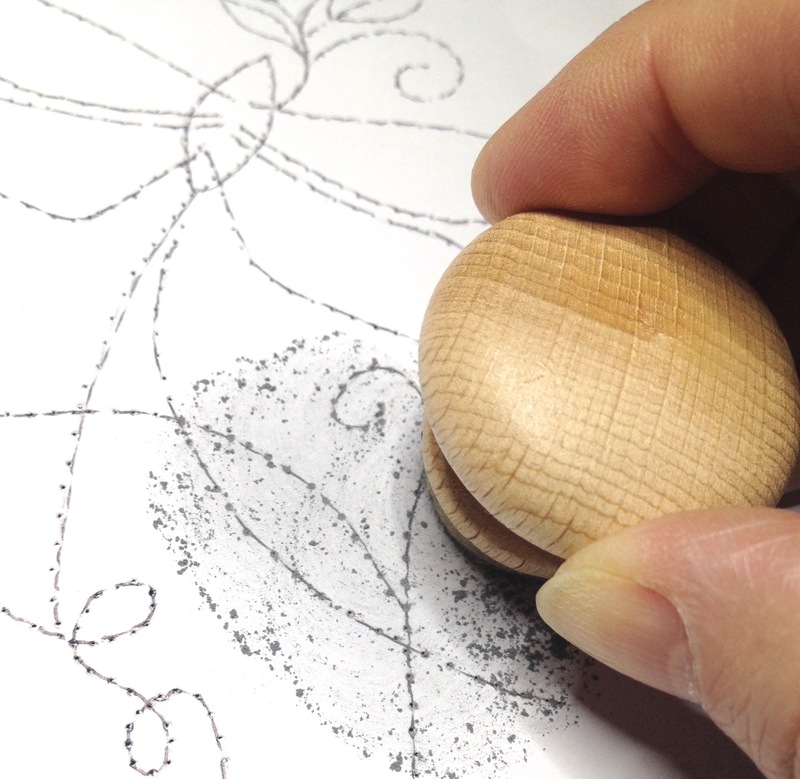 The image appears on the fabric as tiny dots of powder which are then joined together using a very fine coloured pencil or water soluble fabric marker. 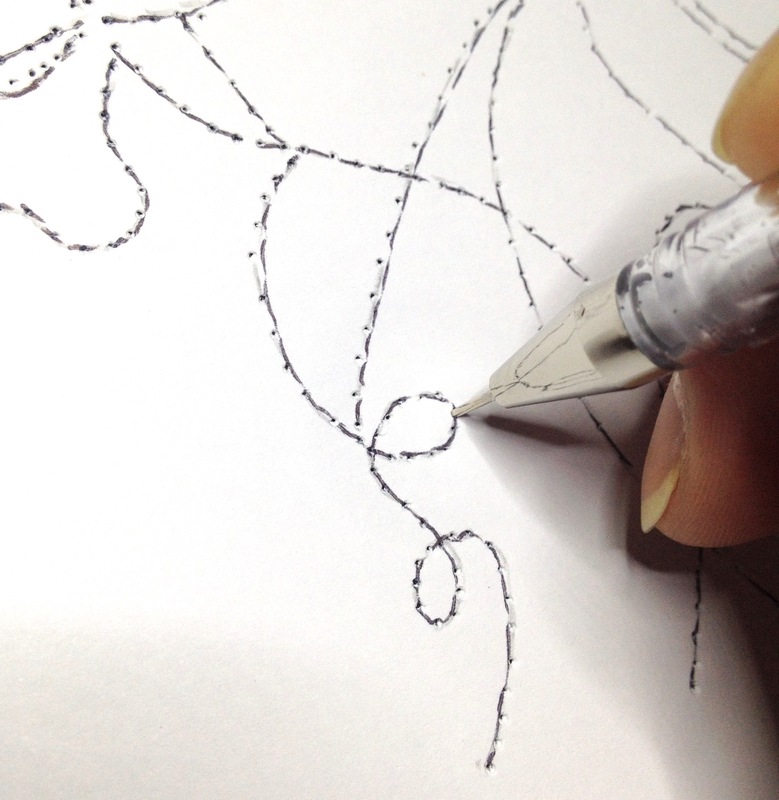 We never use graphite drawing pencil as this leaves dirty marks on your embroidery thread. This is a great method for quilters too! It can be tricky finding the necessary materials so we have created prick and pounce kits which have everything you need.